Liposuction is a cosmetic procedure that that helps you to removes fat. Liposuction surgery sculpts the body. After enormous diet & exercise there is a fat which does not go from your buttocks, thighs, hips, love handles, calves, breasts, arms, neck, etc., So for that matter liposuction elite cosmetic surgery center provides Liposuction technique and it is the best procedure we can do to remove resistant fat from your problem area. It is one of the safest & popular cosmetic procedure that we are using at the Elite cosmetic surgery center at an affordable cost. In case of gynecomastia(Male breast enlargement). Liposuction gives the best results, it is generally done using a cannula & negative pressure suction to remove stagnant fat. Normal weight & good skin elasticity are the favorable factors for the desired result. In laser-assisted liposuction is procedure LASER energy is used to destroy the fat cell, this kind of liposuction is particularly useful for in the treatment of small pockets of fat associated with the modest amount of loose skin, common in areas like the neck. This procedure is minimally invasive. In this procedure, a very small cannula is used to target fat cells. Reduced bleeding is observed in this procedure. The LASER also stimulates the production of collagen during the healing process, in turn, increasing the firmness and overall appearance of the skin. It has less bruising & faster recovery comparing to conventional liposuction. Elite Cosmetic Surgery Center provides the best nonsurgical fat reduction at an affordable cost in Nashik. Non-Surgical & minimally invasive options for fat reduction includes technology that uses heat or cooling or medication injection to reduce fat cells. If you’ve got a little too much flab or excess skin in your abdomen that can’t be is a cosmetic plastic surgery used to make abdomen thinner & more firm. Nowadays junk food, sedentary lifestyle taking the toll on our health & body so, its quick fix is Abdominoplasty treatment which is provided by elite cosmetic surgery center in Nashik. Basically, this surgery involves removal of excess skin & fat from the middle and lower abdomen in order to tighten the muscles and fascia of the abdominal wall. 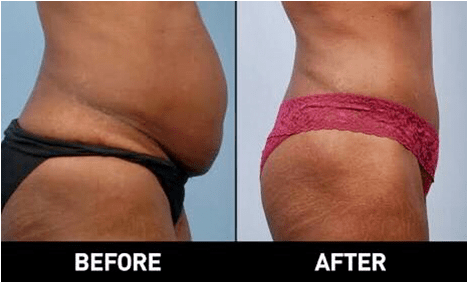 Complete Abdominoplasty This is for patients who need Abdominoplasty most, bikini level incision is taken and the surgeon gives shape to your skin and muscles. Drainage tubes are put until a few days. Partial/mini AbdominoplastyThese are performed on patients whose fat deposits are below the navel, a short incision is taken, skin is separated from the line of an incision and your belly button. This is performed with an endoscope. Circumferential AbdominoplastyWhen there is excess fat on the abdomen as well as back, this surgery is performed this allows removal of both skin and fat from the hip and back which improves the shape of your body 3 dimensionally. We use these 3 types of Abdominoplasty to reduce tummy fats and we provide this treatment at affordable cost. Which patients can opt for this? Usually patients with loose and sagging tissue after pregnancy or major weight loss men and women who are in good health. Generally, women who have had several pregnancies may find this surgery useful for tightening their abdominal muscles and reducing skin. This is also an option for men and women who were once obese and still have excess fat deposits/ loose skin around the belly. If you are a woman who plans to get pregnant, then you may want to postpone a tummy tuck until you are done having children. As future pregnancy can separate those tightened muscles. If you are planning to lose weight then this is not an option for you. It should be a last resort after you have tried everything else. As this is not an alternative to weight loss. What is the difference between Bariatric Surgery, Liposuction & Abdominoplasty? Bariatric is more morbid surgery as it involves surgery over intestine to reduce food absorption. In liposuction / Abdominoplasty, it involves only a superficial part of the skin and subcutaneous tissue. It does not involve any procedure involving intestine/opening of the abdomen so it has lesser side effects. Also after bariatric surgery when patients lose weight skin become lax and sag down so patient requires Abdominoplasty to remove that excess skin. In Nashik, elite cosmetic surgery center is one of the best cosmetic surgery centers. Liposuction is one procedure in which one or more areas are treated. It can be performed either in local or general anesthesia. In liposuction process stab incision are made easy to heal. What is Liposuction can’t Do? You can’t consider Liposuction as an alternative for proper diet and exercise and it is not meant to treat obesity. In case of cellulite or loose skin, it does not give a desirable result. The result of Liposuction treatment may be affected by weight gain, pregnancy & aging. What is Liposuction can’t Treat? It can improve your body, contours & proportion by removing excessive & stagnant fat deposits. Many times liposuctions are performed along with abdominoplasty, Breast reduction, facelift. What is the difference between Liposuction, Abdominoplasty & Bariatric Surgery? Bariatric Surgery involves surgery over intensive to reduce food absorption. In the case of abdominoplasty, it does not involve intestine & opening of the abdomen. It has lesser side effects. In abdominoplasty, it removes excess fat along with excess skin, But in liposuction, it only removes excess fat. Take the supplements prescribed by your surgeon. For 1st few weeks after surgery, you need to wear a compression garment to minimize swelling and encourage a smooth, compact abdominal shape. As per your surgeon’s instructions, start walking around within 1st few days to encourage blood flow and healing. Do not stretch / stand up straight during 1st 3 weeks of healing. Avoid alcoholic beverages for 72 hour before and after treatment. Manage your drainage tubes as per your surgeon’s instructions. Take medications like antibiotic pain killers as prescribed by your surgeon. Full Recovery takes 3-6 months. As like any other surgery you will have pain and swelling in Abdominoplasty Surgery. You may have numbness, bruising, overall tiredness for some period of time. No, if you are doing it for cosmetic purpose. But if you have a hernia and it is getting treated by this surgery then you can have an advantage of that. Difference between liposuction & Abdominoplasty? Liposuction removes excess fat but no effect on loose skin Abdominoplasty remove excess fat and loose skin and fat also. While both procedures are excellent body contouring procedures it’s important to determine what specific issue must be corrected. If the problem is loose Abdominal muscle and excess skin after excessive weight loss then Abdominoplasty (Tummy Tuck) is best for you. To Experience the New Technologies Treatments in Nashik, Visit Elite Cosmetic Surgery Center for Best Fat Reduction Surgery/Treatment in Nashik.